I saw a post that Ashley Mershon shared to Facebook of a gelding who tied well, but didn’t have the best patience when he was alone—no horses or humans around. Ashley’s way of working on this was to tie him to her patience pole and allow him to pull on himself until he was ready to sit quietly. We use a 6′ diameter round treated post it is concreted in the ground about 4ft and 8-10′ out of the ground. I have a round swivel ring on the top that I snap a standard bungee cross tie on. I use my patience poles for horses who already know how to stand tied fairly well but might have the tendency to get bored and paw the ground when tied to a stationary object like a hitching post or a panel. The patience pole allows them to move their feet if they’re anxious, without getting anywhere, thus traveling no where fast until they learn to stand quietly. 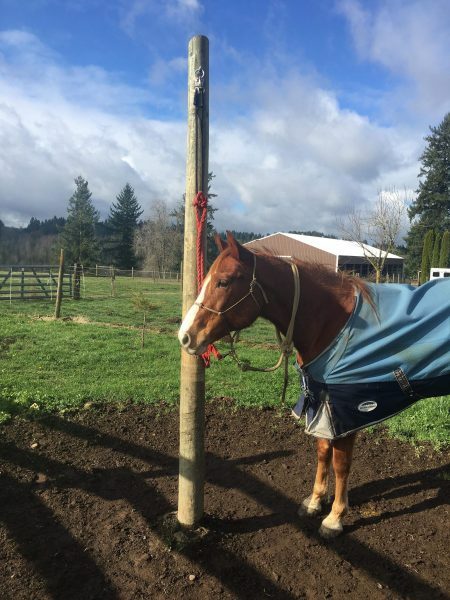 For horses who are awful to tie, never been tied or need to work through some separation anxiety we have a patience “tree” its a large fir tree with a chain around a thick branch attached to an inner tube with a cotton rope tied to the inner tube. The tree allows for fairly major freak outs while learning resistance of the halter and lead, think teaching a colt to halter break by haltering and letting them drag a lead rope around. Once the horses have learned to not challenge the resistance on the rope on the halter they can be safely tied to the poles out back. Because I always tie with a bungee type and they quickly learn the give and take of the resistance training. Ashley uses a bank robber’s knot, the second knot in this blog, as her knot of choice when tying on the patience pole. Ashley owns and operates Red Raven Ranch in Sandy, Oregon.